Winter Pet Dangers | All Things Woof Meow, Too Inc.
Pets face many unique dangers during the coldest months, but savvy pet owners can take steps to keep their dogs, cats and other pets safe and comfortable no matter how low the temperature goes. The exact dangers pets face vary depending on seasonal conditions and pets' individual tolerances, but understanding these common dangers can help every pet owner avoid unnecessary risks to their beloved pets. As temperatures fall, pets are at risk of lowered body temperatures, cardiac arrest, freezing tissues and other problems associated with frostbite and hypothermia. Even indoor pets are subject to these risks if they are allowed outside for walks or extended periods. Keep Pets Safe: Provide pets with good, warm shelter and appropriate winter clothes if necessary. Minimize outdoor time on the coldest days and dry pets off when they come indoors so they can warm up quickly. Antifreeze has a sweet, attractive taste to pets, but it is dangerously toxic and even a small amount can be fatal if ingested. Other de-icers or common winter chemicals can also pose poisoning risks, as can many holiday human foods such as chocolates or other treats. Keep Pets Safe: Clean up any chemical spills immediately, and keep chemicals out of reach of pets at all times. Do not give pets any human treats, instead offering them special pet treats if desired. If pets show poisoning symptoms, seek a vet's care immediately. When pets are cold, they may want to get closer to fireplaces, space heaters and other heating elements, where they risk singed fur or skin burns. When heaters are inappropriately used, pets are also at risk of being caught in home fires. Keep Pets Safe: Do not use exposed heating elements or open flames around pets unless they are closely supervised. Avoid heated blankets in pet beds since wrinkles and folds can cause the blankets to overheat and may cause burns. In the event of a fire, take all possible steps to rescue pets without risking human life, including notifying fire and rescue personnel about the presence of pets. Pets need more calories in the winter months to generate sufficient body heat to stay warm, and adequate water can help them combat the effects of cold. Dry skin, dull coats and weight loss are common effects of dehydration and malnutrition in the winter. Keep Pets Safe: Use a heated pet bowl to keep water from freezing in outdoor pens, and always have plentiful clean water available for pets to drink. Consider increasing meals slightly to provide adequate winter nutrition and compensate for calorie-burning weight loss, as well as help pets store a layer of fat for winter insulation. Winter rain, ice and snow can wash away and cover scent markers and visual clues pets might use to orient themselves and find their way home. 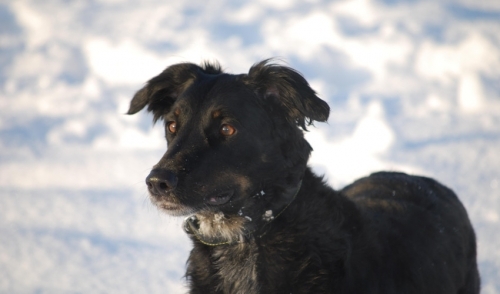 While pets should not be permitted to wander at any time of year, if they do stray away from home in the winter, it is much easier for pets to get lost and disoriented. Keep Pets Safe: Always keep a close eye on pets outdoors and do not let them wander without supervision. Use sturdy leashes for walks, and keep yard gates firmly fastened. Be sure pets are microchipped and wearing updated identification tags in case they do get lost, and having a recent photo on hand will help if it is necessary to search for a lost pet. Pets face many risks in the winter, but when pet owners are aware of those risks, they can more easily take steps to keep their pets safe, comfortable and healthy even during the coldest months.